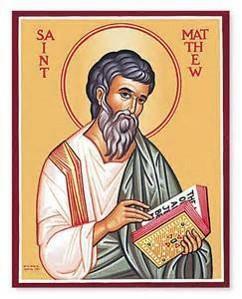 Today we led Mass for the whole school to celebrate the feast day of St. Matthew. Matthew was a tax collector in the city of Capernaum, where Jesus was living. He was a Jew but he was working for the Romans so the other Jews disliked him. But Jesus did not feel that way about Matthew. One day, Jesus saw Matthew sitting in his office and he said, "Follow me." At once, Matthew left his money and gave a big supper for Jesus. He invited other friends like himself to meet Jesus and listen to him teach.